With multiple available 4x4 systems, Selec-Terrain® Traction Management, Class-Exclusive Quadra-Lift® suspension system, and Off-Road Adventure II Group package, the new Jeep Grand Cherokee is no wallflower. Possessing unheard-of power and delivering the latest in luxury and technology, it’s first-rate from performance to onboard comfort. What Makes the Jeep Grand Cherokee a Cut Above Rival SUVs? Harnessing up to 295 hp and 260 lb-ft of torque from the standard V6 up to a staggering 707 hp and 645 lb-ft of torque from the available supercharged 6.2L V8, the Jeep Grand Cherokee can tow up to 7,200 lbs. A standard 60/40 split-folding rear seat in the Grand Cherokee interior lets you switch between 36.3 cubic feet of cargo space as standard to 68.3 behind the 1st row, and premium features include Uconnect® 4C NAV with an 8.4-inch touchscreen, 19-speaker Harman Kardon® premium audio system, and heated and ventilated front seats. Even at a standstill, the Jeep Grand Cherokee immediately arrests your attention. 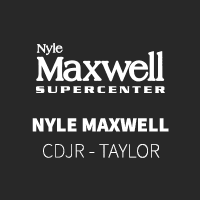 Come check it out in person and explore special offers at Nyle Maxwell CDJR of Taylor. Considering the Dodge Durango as well? Compare these two well-loved SUVs with Nyle Maxwell CDJR of Taylor to see which one is truly best for your driving needs.